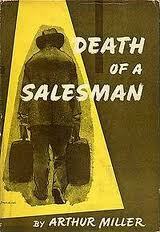 Today Teena and I saw Death of a Salesman at Soulpepper Theater in the Distillery District. Usually I would copy and paste in the description of the play here but I could not find one that adequately describes this play to my satisfaction, so I will attempt to describe it myself. Willy Loman is 63 and his life, once full of promise, has fallen apart. He constantly fights with his favorite son, Biff, can't pay the bills, is unable to drive to his sales calls and drifts off down memory to find out where it all went wrong. He is an angry man, feeling sorry for himself. His son, Biff, too has issues. Once the high school football star who was about to receive an athletic university scholarship, he loses the opportunity due to a bad math grade that he refuses to do something about. But why? His too is a sad story. There really are no happy stories in this family. His long suffering wife, Linda, has spent a lifetime trying to raise the kids, keep up the house and be supportive of her downhill heading husband. I felt really sorry for Happ, the womanizing younger son, who is really the forgotten son. He has a steady job and tries his best to bring some optimism to this depressed family but in vain. I took this play in school, but have never seen it on stage. To read this play is quite confusing, to see it on stage is quite powerful. 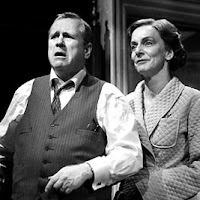 There were no poor performances in this production and I thought Joseph Ziegler was fantastic as Willy Loman. His role demands he play the full range of a young, optimistic, excited younger Willy and the older defeated, tired, shuffling Willy. Although not a happy story, I am glad that I finally had the chance to see it on stage, and extremely glad that it was this production of the classic, that I saw.